Actual Cubic Feet per Minute of gas volume at the specified temperature, pressure, moisture, elevation, and gas composition. Assembly from which a Bin Discharger is suspended from a storage bin. The interspersing of air or other gases with powders or particulate material causing a reduction in density and a consequent increase in flowability. A particle of solid or liquid matter that can remain suspended in air because of its small size. Particulates under 1 micron in diameter are generally called aerosols. A term usually applied to a rotary vane valve which prevents air or gas from entering or exiting a dust collector or other device where a pressure differential exists, yet allows product to transfer continuously. Sometimes called a rotary feeder when used to control flow rate. This is the minimum angle measured from the horizontal on which a solid, powder, or granular material will slide on a flat surface. Product characteristics, as well as smoothness of the surface on which it attempts to slide, effects the angle of the slide. One atmosphere is approximately 14.7 PSI or 29.92" Hg. Absorption of sound pressure. Attenuation reduces only the amplitude of a sound wave while leaving the frequency unchanged. A helical or closed flight screw-like device used to move or control material flow.Baghouse Collector - A dust collection device using fabric filter media to separate particulate from a gas stream. A measurement of the pressure of the atmosphere. Standard is 29.92" Hg. A method of drying in which material is processed one batch at a time. This is in contrast to continuous drying. A crimp made on both the top band and the adapter ring of a Bin Discharger to serve as a retainer to minimize slippage of the drawband assembly. The bent lip may be replaced by a wire bead ring. The capability to evaporate 34.5 pounds of water per hour into dry steam at 212Â°F (approximately 33,500 BTU/hr). This is moisture located inside a particle. It must first migrate to the particle surface before it can be evaporated. Since removal of this moisture is not efficient, its removal requires extra time and heat. The no-flow condition that occurs when the product forms a stable, self-supporting "bridge" in the bin over the outlet. A weight-to-volume ratio. Bulk density is usually expressed in terms of pounds of material per cubic foot (PCF), kilograms per cubic meter, grams per liter, or grams per cubic centimeter. A high temperature process unit in which material is heated in a reducing environment to remove oxygen or other carbonaceous materials. The process is commonly used to reduce limestone (CaCO2 ) to lime (CaO2) or the reduction of other ores such as copper or cobalt. The volumetric or gravimetric flow rate from (or to) a piece of material handling or process equipment. The air velocity at any point around a hood a hood or at a hood opening necessary to contain and capture airborne dust. The gas velocity that is necessary to keep dust airborne. Velocities of 3500 to 4500 ft/min in duct work are typical but actual requirement is dependent on the physical properties of the dust. 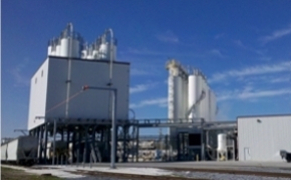 A drying process in which a portion or all of the drying gas, most often nitrogen or another inert gas, is re-circulated rather than exhausted. This minimizes gas emissions, recovers solvents from gas, reduces explosion and fire risks, and increases thermal efficiency. Any material that exhibits the characteristic of molecular attraction in which the particles are united throughout the mass. The transfer of heat by physical contact between surfaces. A mode of drying involving removal of surface moisture. The evaporation rate during constant rate drying is limited only by the rate of heat transfer from the process gas. The product temperature remains constant because the heat added by the process gas is equal to the heat removed by evaporating moisture. The transfer of heat through a liquid or gas by the actual movement of molecules. This refers to two materials with different temperatures flowing in opposite directions. Larger temperature differences increase heat transfer rates. The total elapsed time between identical points in two successive and identical process operations. A dust collector that separates particulate from air by the centrifugal force generated by spiraling gas.Damper - A device used to control air or gas flow by adjusting the pressure drop. Sound-pressure level measured. See chart for typical values. The logarithmic ratio between a known reference and a quantity of electrical or acoustic signal power. Change in pressure, or pressure drop that occurs across an air moving system. A drying agent consisting of a chemical substance that absorbs moisture. For air containing water vapor, it is the temperature at which liquid water begins to condense for a given state of humidity and pressure as the temperature is reduced. Dry-film thickness usually expressed in thousandths of an inch. Drawbands are used to secure the flexible connector to the adapter ring and to the bin discharger's top band. Carman uses double drawbands (two at the top and two at the bottom) on all inlet socking arrangements. The reduction of the rate of material flow near batch completion to avoid overshooting of desired batch weight or volume. Mechanism used to develop and maintain stroke and frequency on vibrating machinery. Drive selection is a function of the application and environment in which equipment operates. Fiber glass or steel coil springs used to support the trough and produce the K-rate necessary to vibrate at or near its natural frequency. Spring/Model selection is a function of the application and the environment in which the conveyor will operate. The actual temperature of a gas taken with a conventional thermometer. An air-cleaning device used to remove particulate loadings from exhaust systems. A system operating 180< out of phase with the conveyor trough (weighing exactly the same and with an identical drive spring system) used to reduce dynamic force transmission. The force transmitted by vibrating equipment into its supporting structure or foundation.Evaporative Cooling - When surface moisture is present, evaporative cooling occurs in a convection drying or cooling application. Cooling occurs as heat is transferred from the particle to the moisture as it evaporates. A diffuser at the fan outlet which gradually increases the area to decrease velocity and to convert kinetic energy to static pressure. Air in excess of the amount necessary to combust all the available fuel. The amount of exhaust gas (air, products of combustion, and water vapor) leaving the exhaust stack usually measured in ACFM. When a Bin Discharger is installed on a bin experiencing funnel flow, the flow pattern expands to the Bin Discharger's inlet diameter. Performance requirement for a fan to meet specific system requirements in terms of ACFM and pressure drop at the fan inlet. Theoretical relationships between CFM, RPM, SP, and HP. Any of a class of equipment whose purpose is to control the flow rate of material either by weight or volume. The actual amount of material discharged per unit of time.(i.e. lbs./hr. or PPH, tons/hr. Or TPH). Pliable unions that join non-vibratory to vibrating equipment such as charge and discharge chutes, duct work, etc., to contain product or air and prevent the transmission of vibration and stresses. The condition in which a dry solid has become sufficiently aerated to behave like a fluid. This can create problems like uncontrolled flow through an outlet or feeder. A process whereby particles are separated into two groups by entraining smaller particles in an exhaust airstream and retaining larger particles in the fluidized bed. A condition whereby bulk solid materials are partially or totally suspended in an upward moving gas stream. The suspended particle bed often takes on properties of a fluid as the bed seeks its own level and takes the shape of the container. Particle movement is very active; heavy particles sink and light particles float. An inertial type of CARMAN drive which includes either vibrating shaker motors or rotating eccentric weight assemblies. A burner which has its combustion air supplied under pressure normally with a low pressure fan. A material condition characterized by relatively unaided flow without flooding, arching, ratholing, or the need of external flow aid devices. The number of cyclic occurrences in a given period. Usually expressed in cycles per second (CPS), cycles per minute (CPM) or revolutions per minute (RPM). A material that is easily crumbled or pulverized. The typical flow pattern that exists when a static hopper is not sufficiently steep or smooth enough for the material to slide on the hopper. Instead, flow is restricted to the channel of product located directly over the outlet. The effect of a bin discharger is two-fold. The outlet diameter increases to the bin discharger inlet diameter and vibrations cause layers to slough off the top of the stagnant mass. The slight pressurization of process or storage equipment with inert gas to avoid condensation, evaporation, explosion hazards, etc. The pressure differential between atmospheric and that measured at the conditions of the system. A dust weight unit commonly used in pollution control. 7000 grains = 1 pound. A measurement of particles in an air stream in grains per cubic feet of air or gas handled. Controlling material flow on the basis of weight not volume. The force or pressure that is exerted by the weight of material in the bin above the hopper opening or bin discharger. This is the amount of heat required to accomplish the process requirement. We usually express heat load in terms of BTU/pound of product or BTU/lb of water removed. Normally refers to the frequency of electrical voltage measured in cycles per second (CPS). The symbol for mercury often used in the measurement of pressure: (1" Hg = 13.6" WG). A measurement of work performed over a period of time. The exact definition of 1 HP is 33,000 ft - lbs. per minute, i.e., 33,000# is lifted one foot in one minute. The ratio of the actual water vapor pressure in a given volume of air to the saturated vapor pressure, i.e., the ratio of the amount of water in a given sample of air compared to the amount it can hold when 100% saturated. A material that readily absorbs and retains moisture. Inches of Water (aka Inches WG) - A unit of pressure equal to the pressure exerted by a column of water one inch high. At standard temperature, 1 PSI = 27.7 Inches of Water (WG). This is the angle on which the product will shear and slide on itself. In a static funnel flow bin, the ability for all the material to empty from the tank is a function of the material's internal shear angle. Spring (steel coil, air, or rubber) on which vibrating equipment is mounted to minimize force transmission to the support structure or foundation. The theoretical number of hours after which 90% of the bearings subjected to a given set of conditions will still be operational. A liquid filled u-shaped device for measuring the static air pressure at a point in the air system relative to another point. The pressure difference causes water to rise and fall. The difference in the level of liquid columns, usually water, columns is equivalent to the pressure differential. A measure of the strength of an object's interaction with the gravitational field. A measure of an object's resistance to changing its state of motion when a force is applied. The flow pattern where all of the product in the Bin is in motion whenever any product is being withdrawn. This results in a first-in, first-out flow pattern. A unit of length equal to one millionth of a meter. In general, particles down to 10 microns can be seen without the aid of magnification. A unit of measure equal to 25 microns or one thousandth of an inch. It's normally used to measure the thickness of paint or other surface coatings. A set of physical dimensions of motors as established by National Electrical Manufacturers Association (NEMA) for standardization between manufacturers. Dimensions include shaft size, shaft location and motor mounting configuration. Compilation of data and information on a material produced by the manufacturers and importers of that material, as required by OSHA's Hazard Communication Standard, 29 CFR 1910. 1200. This is the mechanism that vibrates the trough of a natural frequency feeder or conveyor. Chemical compounds containing nitrogen and oxygen. It is also a major contributor to acid rain. Refers to two materials with different temperatures flowing in the same direction within a device. Smaller temperature differences decrease heat transfer rates. The distance from any point on the flight of an auger, metering screw or spiral elevator to the corresponding point on an adjacent flight measured parallel to the axis. The inverted upper internal cone of a Bin Discharger that transmits force into the stored product and relieves pressure at the product outlet. The no-flow condition which occurs when only a vertical channel of product above the outlet has discharged. A system relying on the weight ratio between the conveying trough of a vibrating conveyor and its structural base for reducing dynamic force transmission. The ratio of existing water vapor compared to that of air saturated with water. Arms that safely suspend a Bin Discharger and serve as the isolation between the adapter ring which is attached to the tank and the bin discharger which vibrates. Rubber bushings in each end of the hanger arms allow movement of the Bin Discharger while minimizing vibration transmission to the tank. The redistribution of particles during handling. A difference in particle size, large particles (+35 Mesh), free flowing products and particle motion are the common causes of segregation. 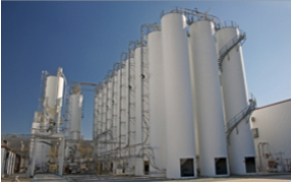 A common example involves storage tanks. During filling, large, coarse particles tend to roll to the outside while fine particles remain in the center. The ratio of the solid weight of a given volume of any substance compared to that of an equal volume of water. The quantity of heat required to raise a pound of a specific product one degree Fahrenheit. Flat spring or hinged arm used to maintain the stroke and direction of a vibrating feeder or conveyor. Conveyor operating conditions describing the movement of a vibrating trough. Storage device of adequate volume to receive product at a higher rate than being discharged without overflowing. The maximum stress (in pounds per square inch) a material can withstand before it breaks. The upper cylindrical portion of a Bin Discharger to which the flexible connector, hanger arms, and drive are attached. The pan of a vibrating conveyor, normally of steel fabrication, designed to convey product and act as the structural member to which the spring system and drive are welded or attached. Standard vibrating conveyor designed to be supported on a solid foundation. The upper 30Â° section of a 30Â°/60Â° Bin Discharger. The characteristic of all fluids to resist flow. The kinetic energy pressure of air in motion. A pressure term defined as a pressure equal to that exerted by a column of water of the same height. 27.7" WG equals 1 PSI. A unit of power. In electrical terms, the power produced by a current of one ampere across a potential difference of one volt. This is normally a 4" x 4" x 1/4" rolled or fabricated angle ring that welds to the bottom of the storage bin hopper. With this arrangement, a mating flange is not required, however, bearing plate and gusset reinforcing is required above each hanger arm. The temperature of a gas stream taken with a thermometer wrapped in wetted muslin. It's used to determine atmospheric humidity when compared to dry bulb temperature.